We'll try anything once....and this was definitely a great try! Our panini maker will definitely be seeing more action in the near future. 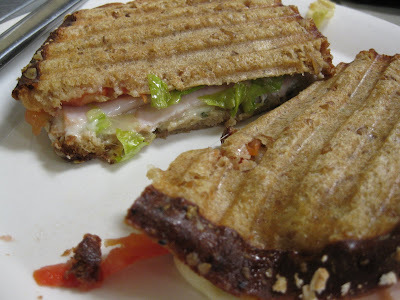 The Turkey Vegetable Panini was a hit! Thick honey wheat bread loaded with roast turkey, lettuce, provolone and tomato and slathered with pesto mayo..YUM!